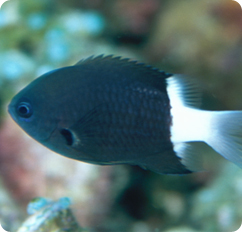 Chromis are very peaceful fish, and will school together in groups. They may still fight somewhat amongst themselves. They are good candidates for a reef tank, and when in groups, add a lot to a reef tank. They can get on the large size, with some growing up to 4 to 7 inches, but most only getting around 2 to 3 inches.